What have you been doing, puppet? By Chance, have we met before? As soon as you complete the previous dead drop mission, a furious Lucien Lachance appears and explains the very serious rift that's been unknowingly set in motion. You are to travel to Anvil and uncover the root of the plot you have unwittingly assisted. Wait near the next dead drop until the courier comes, reveal yourself and demand the answers you deserve. Once you've been "slightly" more informed about the situation, head over to the lighthouse and speak with the lighthouse keeper to acquire the key to the cellar. Make your way outside around back to the cellar. Once inside you are treated to a non-living, breathing nightmare; search for clues and uncover the truth about this morbid plot. Meet up with Lucien at Applewatch Farm - you find him... "accompanied" by the remainder of the Black Hand. Wait until a certain time and speak with Arquen to complete the quest and automatically start the final quest in the Dark Brotherhood quest series, Honor Thy Mother. Once you kill Ungolim, Lucien Lachance will run up to you in a rage and demand to know what you've been doing. He says you have betrayed the Brotherhood and must die for it -- but seeing the confusion in your eyes, he reluctantly concedes that you were not involved and tells you that your last few dead drops were not picked up. At some point the real traitor, the puppeteer of this murderous scheme, must have started replacing your dead drops with their own. He lets you know that you have been unknowingly and systematically killing all the other members of the Black Hand. He tells you to go to Anvil and wait by the site of the next dead drop to find out who the traitor is. Go to the site in Anvil, back up behind the barrel, and wait in sneak mode until a Bosmer named Enilroth puts the Dead Drop orders in the barrel and you receive a new journal entry. Confront Enilroth. He swears he was paid to make the drops and tells you that the traitor who paid him was staying in the Lighthouse under mysterious circumstances. If you want you can steal or loot the reward for the previous contract (500 gold) from him. Find the lighthouse keeper and obtain the cellar key (via request, thievery, threats, or violence), then head around the side of the lighthouse to open the cellar door. The cellar is a nightmare, with various dead animals and people strewn about (and even a severed head marked "Mother's Head"). Make your way through the cellar to the locked door; there is a Crazed Dog in the next room. Kill or sneak around it and find the Traitor's Diary. It seems the traitor is actually another member and has been with the Brotherhood since childhood, sitting dormant the entire time waiting for the precise moment to execute a plan inked in blood. The traitor's mother was murdered by Lucien a lifetime ago as part of a contract and the traitor has endured the years growing more insane, conspiring along with his mother's head against Lucien, the Night Mother, and the entire Brotherhood. It is not known why the mother of the betrayer was murdered; the journal seems to hint that it was the traitor's father who originally put out the contract on her. Now, head all the way northeast to Applewatch Farm to meet with Lucien and explain the monstrosity you've uncovered. Once there, you will find that the Black Hand has tracked down and brutally murdered Lucien, believing him to be the traitor. Arquen approaches you, tells you that the traitor has been dealt with, and proceeds to promote you to Speaker in Lucien's place, presenting you with your own Black Hand Robe and matching Hood. However, because of the collapsing state of the Brotherhood, you and the remaining members of the Black Hand must travel to the Night Mother's sanctuary and seek her advice. Speak with Arquen again between midnight and 3am and ask about the 'Night Mother' to leave for the sanctuary. One interesting confession in the Traitor's Diary is that the traitor was responsible for murdering the crew of the Serpent's Wake in Anvil Harbor. There is a quest, entitled The Ghost Ship of Anvil, that deals with the eradication of the tormented spirits that the massacre left behind. The dead drop order that Enilroth delivers orders you to kill Arquen. If you take the Mother's head from the basement, drop it on the floor of Applewatch, and talk to Mathieu Bellamont, he is visibly shaken by the appearance of the head. This helps signify that he is in fact the traitor. An achievement will be unlocked after speaking to Arquen. Sometimes the Traitor's Diary will not be on the table. ? 10 I have been confronted by Lucien Lachance, who told me I have inadvertently been killing off the members of the Black Hand! I must now travel to the city of Anvil. Once there, I should wait near the barrel behind the statue in the pond, and see who comes to set up this fake dead drop. I must then confront this person and find out why they've been tampering with my contracts. 25 I have obtained a key to the Anvil Lighthouse cellar, where the traitor has been living. I must unlock the cellar door and proceed down, so I may continue my investigation. 26 I have gained entry to the Anvil Lighthouse cellar. 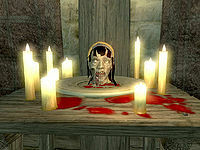 I must now search the cellar for some clue to the Dark Brotherhood traitor's identity, or motives. 30 I have discovered the traitor's diary. 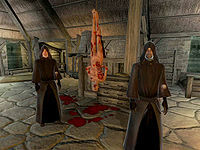 He has been in the Dark Brotherhood for years, and is now a member of the Black Hand! His goal is revenge against Lucien Lachance and all of the Brotherhood for the murder of his mother when he was a child, and he actually plans on killing the Night Mother! I must return to Lucien Lachance at once, at the farm called Applewatch, and give him this information! 100 Finishes quest I have spoken to Arquen, and the Black Hand has been teleported to the site of the ritual. It is possible to use the console to advance through the quest by entering setstage Dark17Following stage, where stage is the number of the stage you wish to complete. It is not possible to un-complete (i.e. go back) quest stages. See SetStage for more information. Esta página foi modificada pela última vez à(s) 01h33min de 14 de dezembro de 2013.